Found in wild hedgerows and waste groung. A large shrub. Masses of flat topped tiny white flowers appear late spring followed by the large bunches of small black/purplish berries in autumn. Traditionally used to soothe sore throats, coughs and bronchial infections. The anti-viral properties are said to relieve the symptoms of flu. The berries have diuretic and also laxative properties. The world Elder comes from the anglo-saxon word 'aeld'. Aeld meant fire and the hollow stems were used to blow up a fire. 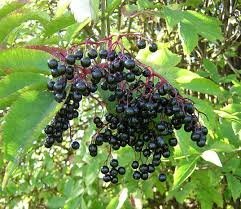 The Romans used elderberries as a hair dye. It used to be used to relieve rheumatism as well as most of the uses of today. The popular 'pop-gun' played with by small boys was often made using elder stems.